Located right in the heart of the city center with easy access to all shopping areas and places of interest, Hotel Jumolhari is one of the leading hotel in Thimphu with traditional Bhutanese hospitality and a distinctive boutique style decor. 26 well appointed rooms provide the utmost comfort and convenience for the discerning vacationer or business traveler. 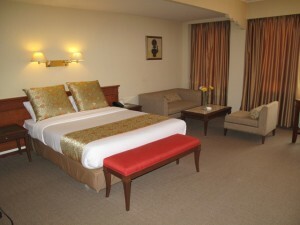 All rooms are fully equipped with up to date facilities and few rooms provide an enviable panoramic view of the valley. The hotel facilities include : Bar, Multi Cuisine Restaurant, Business centre, Beauty salon with Aroma Therapy, Steam & Sauna, Mini Library, Express Laundry Service , Mail / Courier service, Foreign currency exchange, Cable / Satellite television.